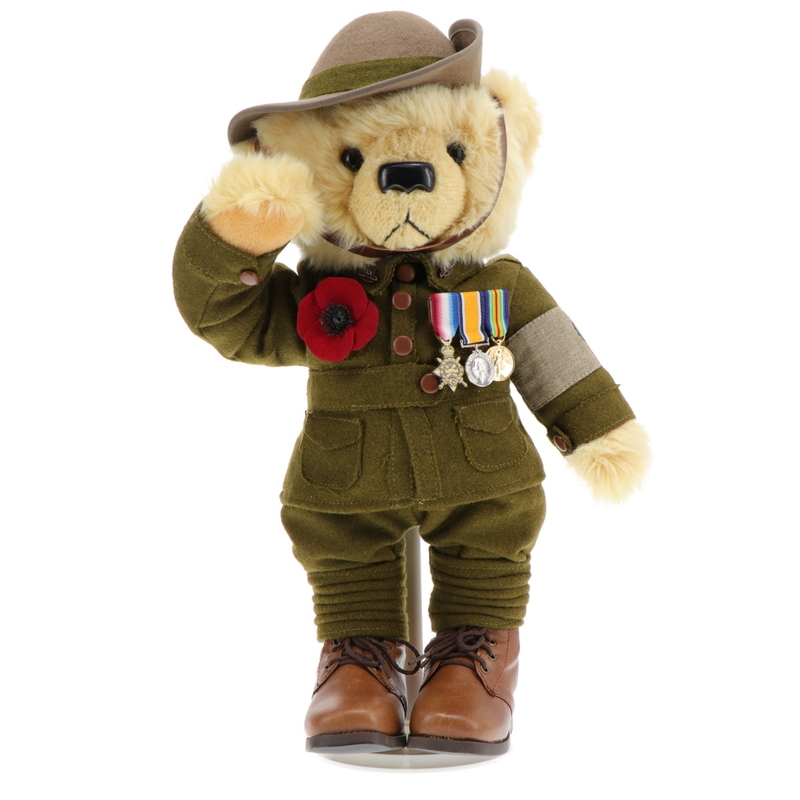 The Armistice Centenary Bear salutes all who served and comes with a group of miniature replica WWI medals, a remembrance poppy and a Centenary of Armistice armband. 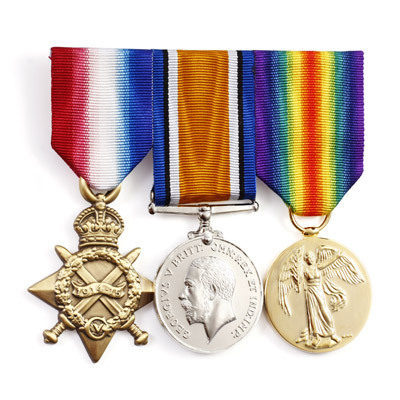 He has not been named and wears no webbing or colour patch to represent a single aspect of service. He is every digger. 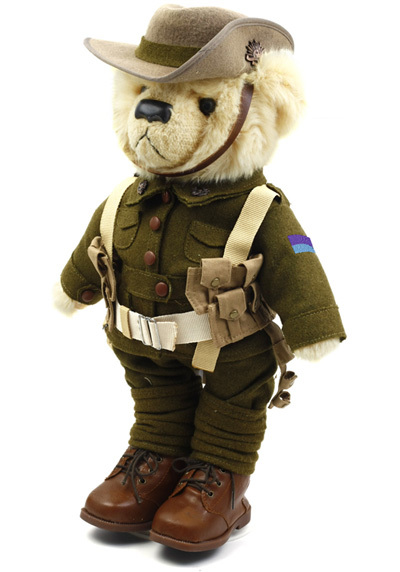 The unique Limited Edition Armistice Centenary Bear is a must have addition to any collection. Standing about 40cm in his boots and slouch hat and limited to just 10,000 units worldwide, this superb collectable fellow comes with a numbered certificate of authenticity. 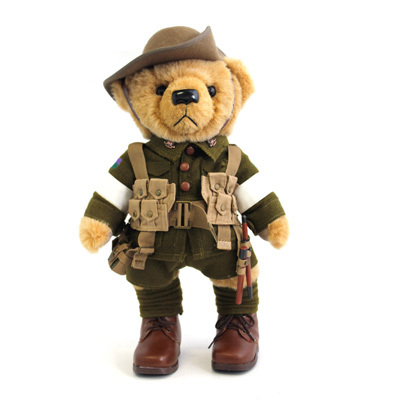 LTD EDITION CAPTAIN JOHN MURRAY BEAR In the final year of the Anzac Centenary, and a year in which the world will unite on 11 November to remember the 100th anniversary of Armistice, let these adorable Australia in the Great War bears help Australians, young and old, connect to the stories and times we remember. 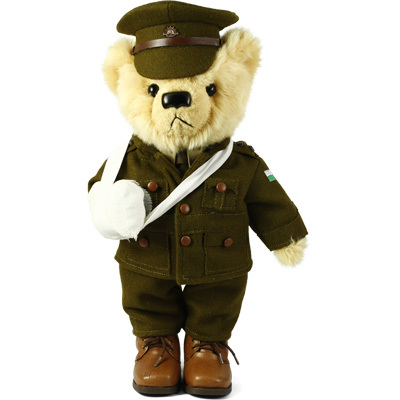 Captain John Murray continues the Great War commemorative bears collection and story. 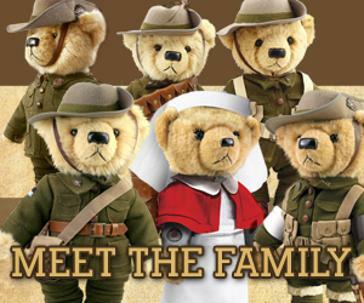 The original 1914 edition Private Murray bear shared the story of Australia's entry into the war and became the central character in the much loved Australia in the Great War diaries shared by thousands of Australians. For the many thousands of Australians who enlisted in the early years of the war the idea of the "Great Adventure" was soon replaced by the realities of deadly new technologies such as aeroplanes, tanks and poisonous gases. But nothing was more deadly than the relentless shells of heavy artillery and the often futile charges into no-man's land. Murray, like many who served, could be promoted through the ranks to replace those officers lost in the fighting. Officers did not wear the 1912 designed standard dismounted troops' khaki uniform with its loose fitting jacket, puttees and slouch hat. Instead they purchased the standard officers' tunic, shirt and tie, and trousers. The three 'pips' on Murray's epaulettes denote his Captain rank and he would wear only the standard British Service Cap, or his Brodie helmet in battle. For hundreds of thousands of Australian wounded, injured or seriously ill, hospitalisation was for the most simply a break from the fighting. Most would return to the front to face the perils once more. With Captain Murray we proudly remember their service and sacrifice and the courage of those who returned to contributed to Australia's development for years to come. The Captain John Murray bear is limited to 5000 units world wide. 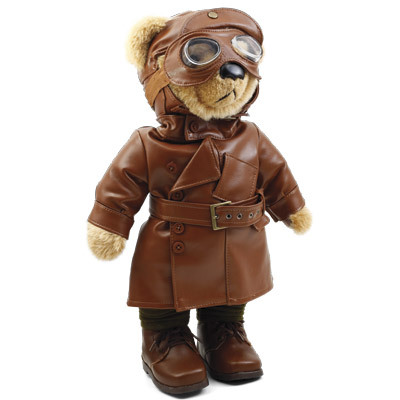 Lieutenant Hendy stands 40cm, is Limited to just 5,000 bears and comes with a numbered certificate of authenticity. SERGEANT GREY WILSON GREATCOAT BEAR - NOW IN STOCK. Sergeant Wilson wears one of the most iconic and versatile uniform items of the Great War - the A.I.F. Greatcoat. Before service abroad most Australian troops had never seen snow or ground ice, and the chilly winters added to the hardships men faced at Gallipoli, in the deserts and on the Western Front. The Greatcoat was essential protection. The heavy woollen khaki coat weighed about 6.5 pounds (3kgs) and served as an outer jacket, additional blanket and often as a shelter. Grey also has his Brodie helmet and anti-gas mask carry bag at the ready. Limited to just 5,000 bears for worldwide collectors, Grey comes with a numbered certificate of authenticity. 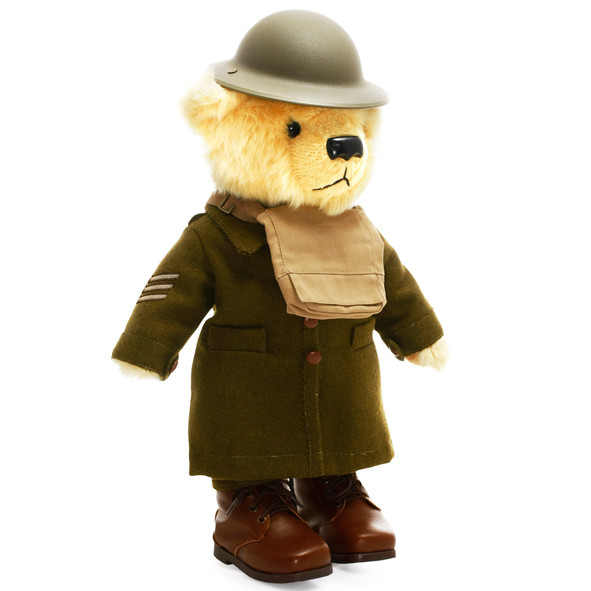 Lieutenant Albert Murray, the Western Front Ltd Edition Bear, is the first ever Australia in the Great War officer bear. He is kitted out in boots and proudly wears his officer pips. In preparation for the Western Front he also wears 'Brodie' helmet and PH anti-gas mask carry bag. This 40cm digger is limited to just 10,000 units worldwide. He comes with a numbered certificate of authenticity. Able (Bodied) Seaman Andy Miller shares the story of the Royal Australian Navy during the Great War 1914-1918. 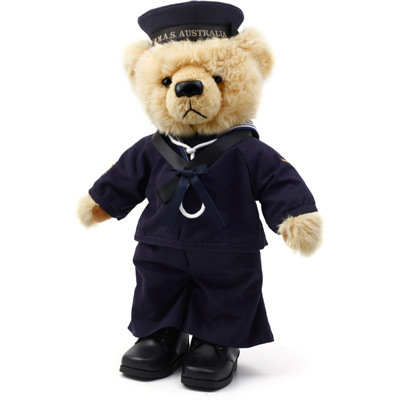 The first Great War navy bear, he wears the Number 1 Dress Blue Serge Uniform with blue seaman's jumper and blue Class II cap with H.M.A.S. Australia (I) cap tally. 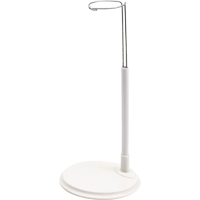 Standing 40cm in his boots, Able Seaman Miller is limited to just 2,500 units worldwide. He comes with a numbered certificate of authenticity. 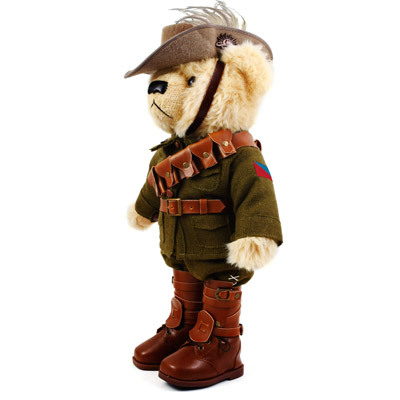 Private Ernest Harvey, the Gallipoli Centenary Bear, stands about 40cm in his boots and slouch hat and wears the standard A.I.F. webbing, complete with water canteen, bayonet and helve (the handle for his entrenching tool). Limited to just 10,000 units worldwide, this superb collectable fellow comes with a numbered certificate of authenticity. 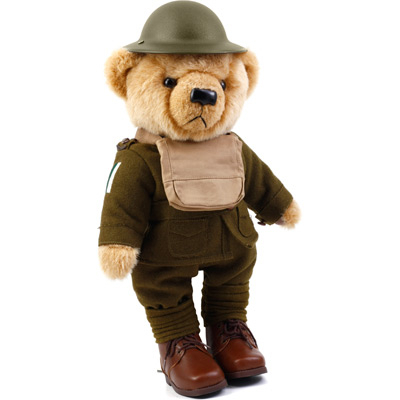 The unique Limited Edition Corporal Cohen Lone Pine Bear is a must have addition to your collection, buy now from Australia's leading military site - Military Shop. Corporal Cohen wears the standard dismounted troops' uniform and webbing but with trousers cut to shorts in the Gallipoli summer. 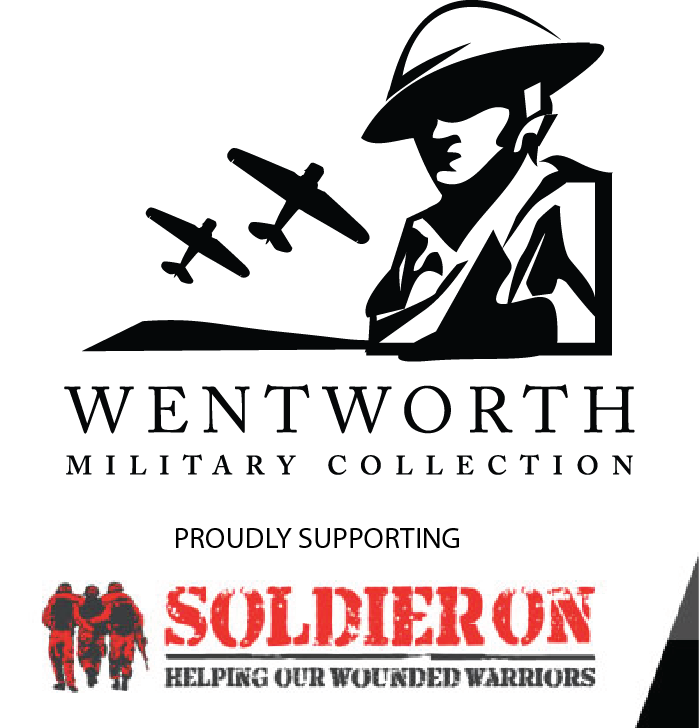 His white armbands and back patch were worn to help diggers identify 'friendly' soldiers in the heat of the battle. Corporal Cohen stands 40cm in his detailed Great War uniform and comes with certificate of authenticity. Only 10,000 worldwide. 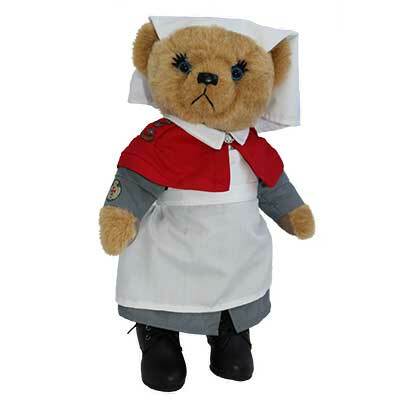 The unique Limited Edition Sister Bernadette Nurse Bear is a must have addition to your collection, buy now from Australia's leading military site - Military Shop. Sister O'Meara's uniform represents the 'working dress' of the Australian Army Nursing Service and includes zephyr grey dress with white collar, white veil and scarlet cape; her rank of Sister is shown by the stars or 'pips' worn on her epaulettes, which are accompanied by curved bronze 'AUSTRALIA' titles. She wears the Rising Sun badge at her throat as a brooch and the cloth badge of the Australian Army Nursing Service is displayed on her right sleeve. Sister Bernadette O'Meara stands 40cm in her working shoes and comes with certificate of authenticity. Only 10,000 worldwide. Trooper Jones proudly represents the unique uniform of the ALH, including an actual emu plume affixed to his slouch hat, the 1903 pattern leather leggings, riding breeches and the 1903 pattern ammunition bandolier. 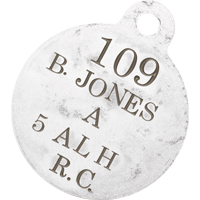 The first ALH regiments were formed in August of 1914 and by war’s end some 32,000 men had served in fifteen ALH regiments raised for overseas service. Trooper Jones is limited to 10,000 bears. 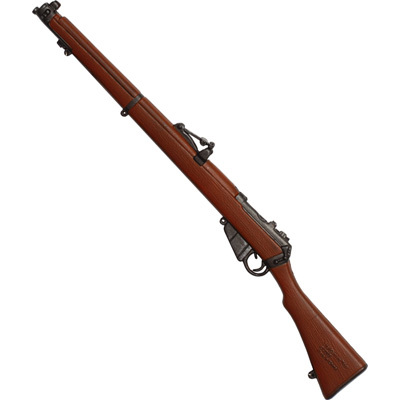 Precision moulded Short Magazine Lee Enfield, the standard rifle of the A.I.F., scaled to suit the Great War collector bears.